My name is Jack Cox. From 2010-2017 I attended Great Marlow School. I remember when I was a student at the school we were brilliant at raising money for charity. This is why … I am contacting you. As far as GMS is concerned this is a hugely impressive challenge being undertaken by one of our own ex-students. Jack was diagnosed with cystic fibrosis (CF) when he was just 18 months old. Cystic fibrosis causes persistent lung infections and limits breathing ability over time. CF has led Jack to have a weakened immune system, meaning that the common cold can hospitalise him for weeks. Living with CF each day is a challenge physically and mentally. For Jack, every day begins with an hour and a half round of inhaled medication alongside physiotherapy. He takes a minimum of 80 tablets each day, to enable him to digest food to and absorb the vital vitamins and minerals required by the body. At the end of the day there is another round of inhaled medication, which again takes an hour and a half, alongside more physiotherapy. This daily routine is in place to prevent further lung damage and hopefully increase life expectancy.Despite all the challenges of CF, Jack has lived his life to the fullest. If anything, his CF, he says, has motivated him to stay as fit and healthy as possible. For the last ten years, he trained everyday as a swimmer and ended up competing at the British Nationals. He has never wanted CF to dictate his life, and this summer he is taking on the enormous challenge called ‘Crossing For A Cure’. 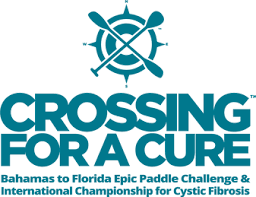 This is a long-distance endurance paddle-challenge, where international participants paddle 80 miles across the Gulf Stream from Bimini in the Bahamas back to the Florida mainland in Lake Worth. The event was inspired by the incredible health benefits of the ocean for those living with cystic fibrosis. For those wishing to follow Jack’s progress go to: instagram jack_cox99. Jack is appealing to the whole of the GMS community to donate to his chosen charity and help him fulfil his wish to make a difference to CF sufferers. All donations from the UK will be converted from dollars to pounds by your bank.